bride.ca | DIY Wedding Trend: Do it yourself Wedding Invitation Kits? DIY Wedding Trend: Do it yourself Wedding Invitation Kits? Do-it-yourself Wedding: buzzword of the year? We 've been noticing more and more interest in do-it-yourself wedding invitations recently and DIY wedding ideas in general. For example, we ran a story on that, a few weeks ago, featuring Paper Garden, and it has pretty much been the single most popular article in this blog since. So we decided to look into it a bit more, run some "numbers" on the site logs. Very interesting..
..the top two searches on the bride.ca search page in October were ... you guessed it: DIY wedding invitations and Do it yourself wedding invitations! Well, perhaps this is only a new trend in Canada.. how about the rest of the world? So we checked with Google.. same thing: over 15,000 searches, in October alone, for the same two phrases, plus wedding invitation kits. Wow.. it seems like you're trying to tell us something! Many print shops and wedding suppliers, across the country, offer them in various formats, kits, price ranges etc. I guess that is a reflection of their increased popularity. (and why not? all you need is a computer and a laser printer!). To find one near you, search wedding invitation kits or DIY wedding invitations on our search page. It will give you related articles first.. scroll down to the business listings. Most of these suppliers will ship anywhere so you may as well look around and find the best style/price combination, but if you 'd rather deal with a place near you then just add your city name to the search, like wedding invitation kits in Toronto for example.. The Thank You Company sells both do-it-yourself invitation kits as well as hand made paper Invitations and Reply Cards that you can print yourself. So many of today's brides and grooms are computer savvy and we started to see a trend towards wanting to print their own invitations on their home computers a few years ago, says Marney. 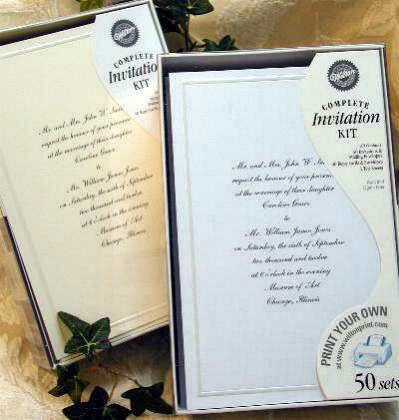 Before kits were available from big name manufacturers, we developed our own version of print-your-own or do-it-yourself invitations with our hand-made paper Invitation Sets. But when Wilton began offering do-it-yourself invitation kits with templates to download for easy printing, we were really impressed with the quality, variety of styles and their economical price. All of the Wilton line is the same low price of $30.00 per box. The simple, single card style Invitation Kits will contain 50 Invitations, 50 Reply Card and Envelopes for each. If there are vellum papers, bows and extra embellishments included, there will be 25 Invitations and 25 Reply Cards with envelopes for each. The box price for both continues to be just $30.00. 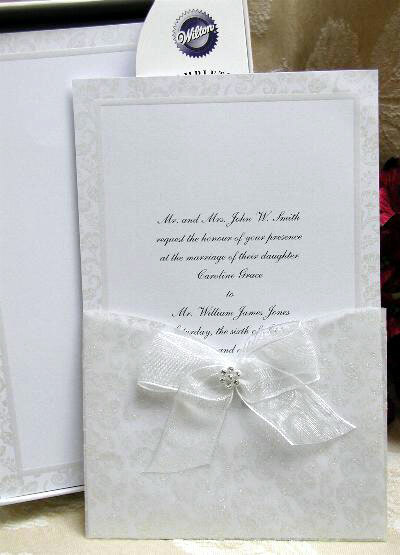 One of the great things about these Invitation Kits is that if there are embellishments for the invitations, the bows are already tied, the pocket enclosures are already made so you simply have to take them out of the box and attach them with the double-sided tape provided; no having to tie the perfect bow to finish the look. 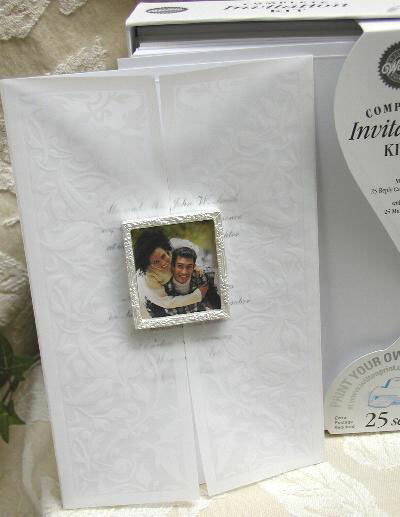 Wilton is continually adding to their line of beautiful and affordable do-it-yourself Invitations Kits so we are too. Comments from our Brides and Grooms are that they were so simple to do with the templates provided... you just fill in the wording and print them. And better yet, they looked so great and so professionally done that no one could believe they printed their own invitations. Imagine cutting invitation costs on average by $350.00. That's money we're sure you can use elsewhere! Check out their full line of Do It Yourself Invitations at thankyou.on.ca. We have sold 1000's of these invitations and they are printed in Canada. Send In The Clowns is the leading provider of invitations in the Kingston area. They carry sample books from all Canadian Suppliers and many US Sample Books. We have lots of wedding accessories, some kits and bulk papers and do custom design and in house printing. So, it turns out that you have options here.. (a) DIY wedding invitations Kits are great, cheap, easy, readily available - and they look good too!. But at the same time (b) you can have-someone-else-do-it wedding invitations instead, for only slightly more, or even not more at all.. Don't you just love technology?? Either way, the news are good. You will not ahve to break the bank on the invitations. Save that money for the honeymoon!